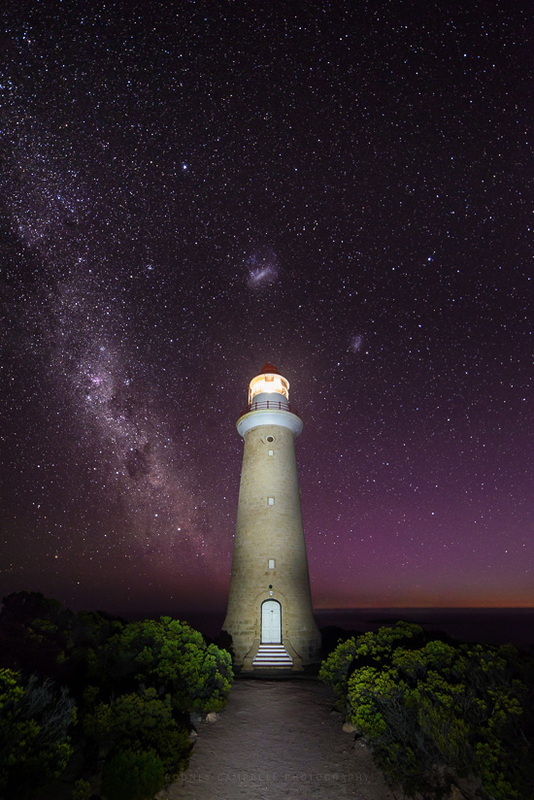 Almost a year ago it was my last night here at the Cape Du Couedic Lighthouse in the remote south western corner of Kangaroo Island. The skies were clearing up again revealing the mysteries and wonders of the galaxies above. It was too good an opportunity to let slip by. So straight after shooting a few shots of the rapidly descending crescent moon I head off for the long walk (OK the 2 minute walk :)) from our digs to here. 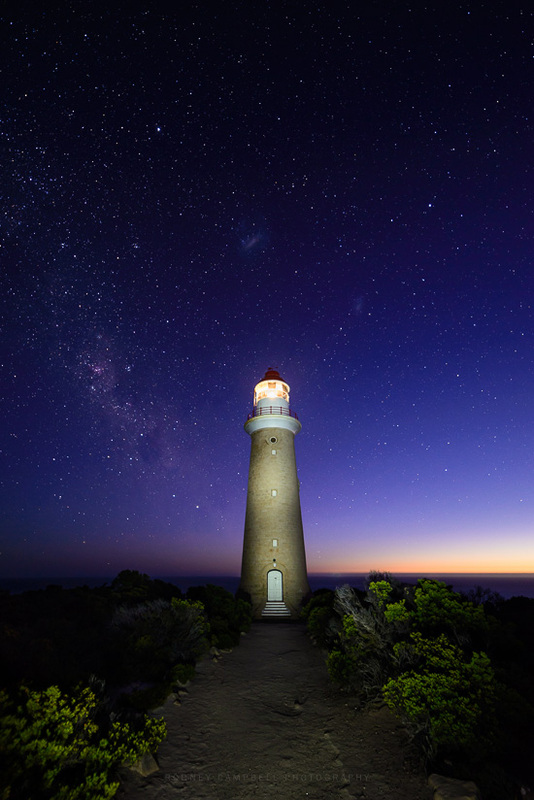 and as the last breath of sunset fades from the sky (9:56PM and now an hour and twenty five minutes after sunset) we can shoot the classic composition of this lighthouse. This time however with some light painting using my torch and the stars and galaxies above. Less than ten minutes later and with a change of angle and view it is well and truly dark enough to start shooting in “starry skies” mode (high ISO, wide open Aperture, 500 rule for Shutter). 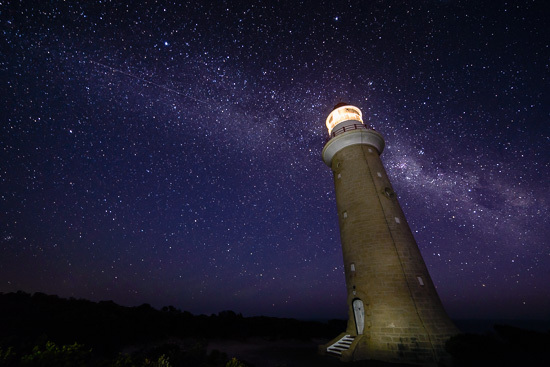 By a quarter past ten I felt it was dark enough to start my star trails frames so I relocated back to the main path to the lighthouse for a more southerly view to the lighthouse. I took a few more static star images with some light painting of the lighthouse and foreground to use as part of my final base image for the star trails. Here is my favourite of those single frames. Sometimes photographic interest can come in the strangest of places. 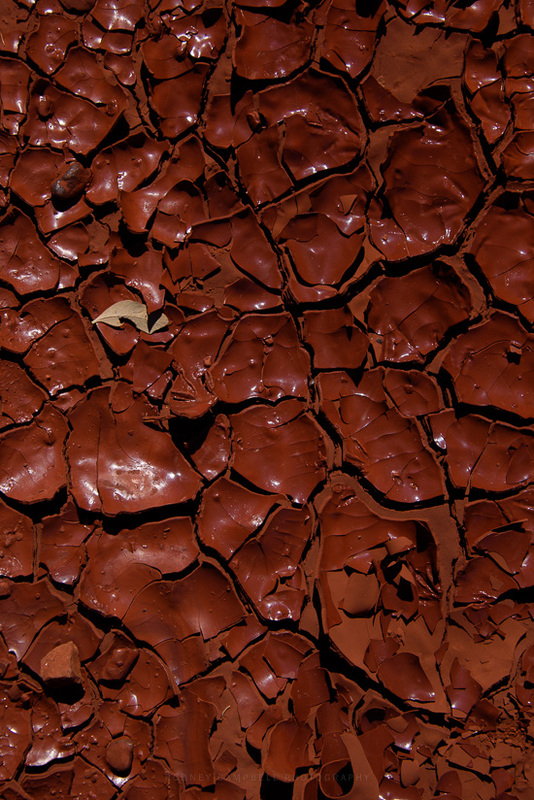 Whilst walking back to our campsite my daughter and I spied this small area of extremely dried mud in a depression in the dirt road. 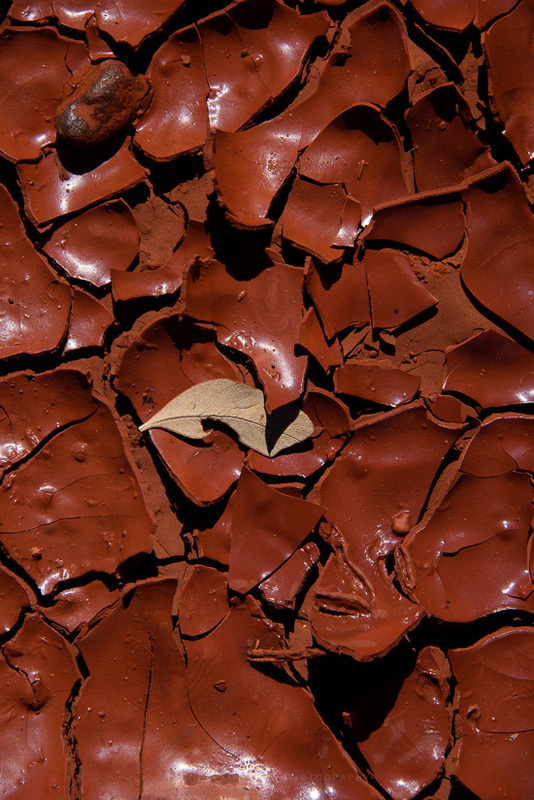 The amazing shards and cracks in the layers of mud were too good an opportunity to miss. Of course that never happened 🙂 – so it’s lucky I grabbed these shots handheld with the trusty 28-300 superzoom when I did :). 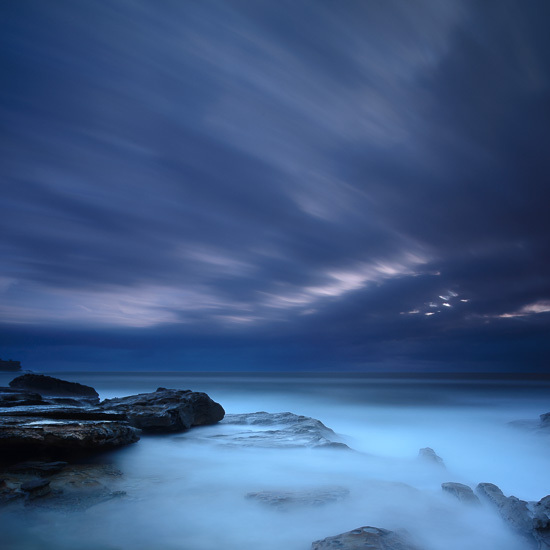 As is often the case when we’re out in the morning on a sunrise session and the overcast conditions continue well after sunrise… We whip out the heavy ND filters to see what they might bring with a post sunrise long exposure. Using heavy ND filters means a lot of waiting. When using them you’re generally looking to produce fairly long exposures in the multi minute region so you’re forever waiting for these exposures to finish (only to find you’ve under or over exposed them – you do get better at judging these with practice however). The LittleStopper is a great filter to use when it isn’t too bright – very close to sunrise and sunset, whilst the stronger BigStopper is more for daytime long exposures. After walking all the way back around the coast to the Randwick Golf Club where we’d parked the cars we decided to check out the tidal pool they have here. The tide was very high so it was essentially swamped which made it too difficult to shoot up close. 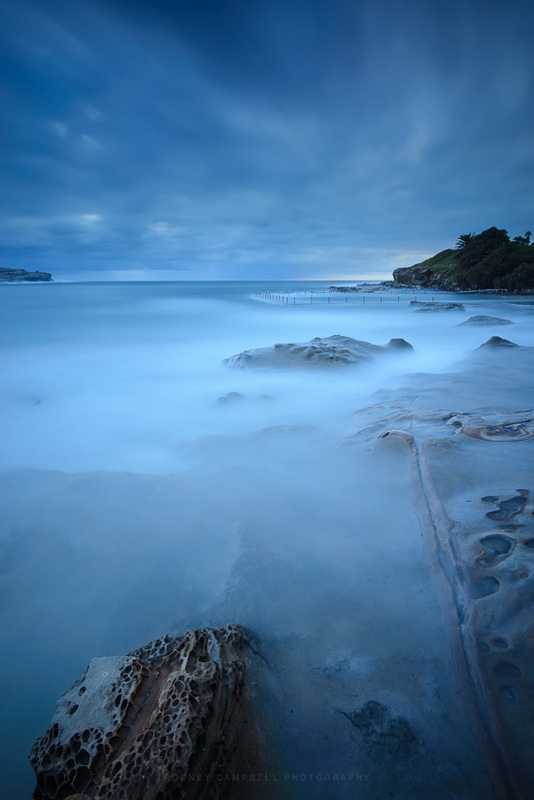 After a few failed long exposure attempts above the pool I followed Gerry a little further up the coast to look back towards the pool and where the sun was hidden behind thick clouds. 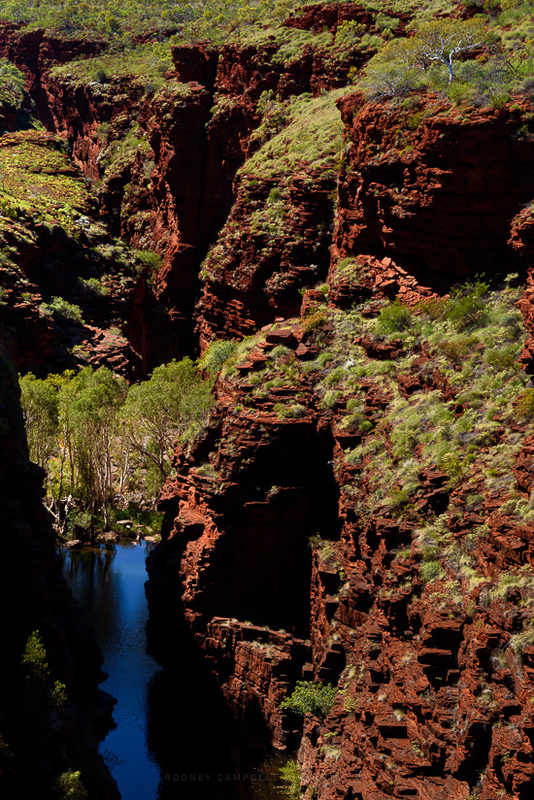 Karijini Eco Retreat is close to the major gorges towards the middle of Karijini National Park. It’s an environmentally friendly Retreat and Campground, nestled in the pristine bushland at Joffre Gorge. 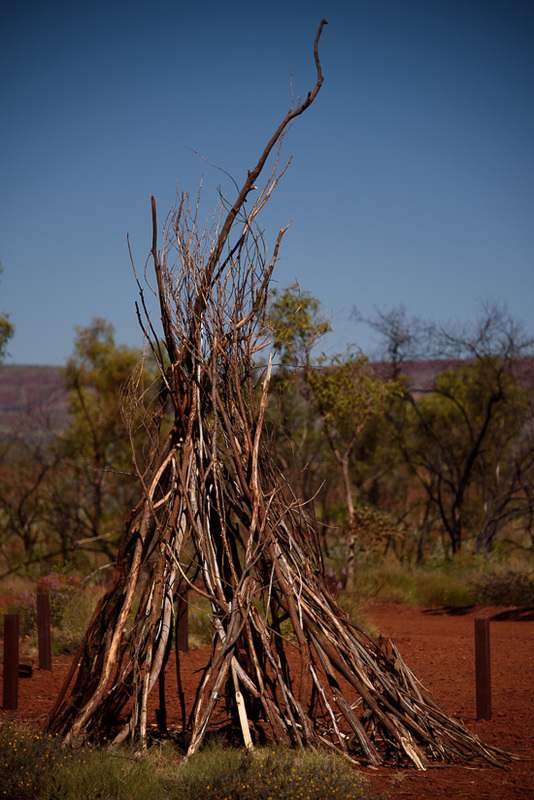 Alongside the outback bush camping experience, the Karijini Eco Retreat is the only facility in the park to offer semi-permanent eco tents and cabins. There is also an outback style alfresco licensed restaurant offering quite good meals – we had an extremely nice lunch here one day. It’s not cheap but the convenience of the location and it’s closeness to, in my opinion the best of the gorges in the park, make it ideal and worth it. It’s just a very short 10min drive to Weano, Hancock and Knox Gorges and the retreat is built on one side of Joffre gorge (easy walking distance). Around midday my daughter and I went for a bit of an exploration of the area and walked from our campsite to Joffre Gorge. 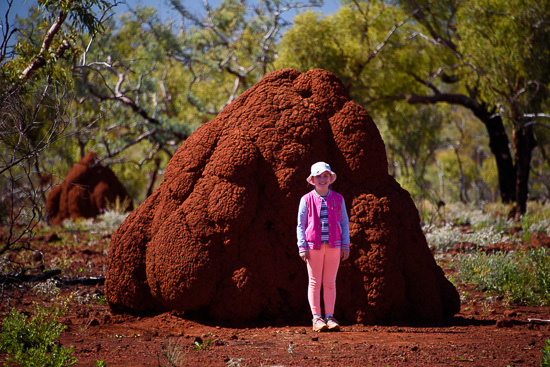 On the way we of course found a number of these amazing and absolutely massive anthills which are a staple of the whole north western Australian area. 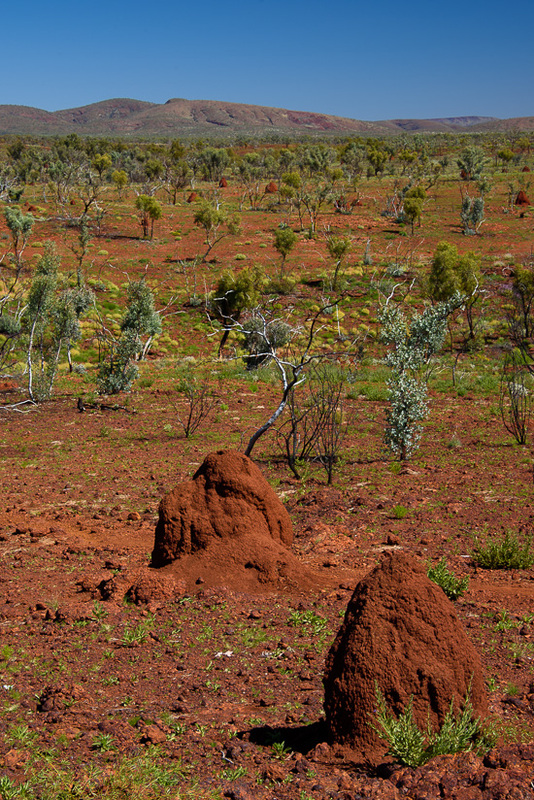 Pretty much since moving west from Katherine in the northern territory we had seen literally millions of these anthills on our journey. They dot the landscape in awe inspiring numbers and some are very very large. They come in an amazing array of sizes and shapes, however what is really interesting is the array of colours that they come in. 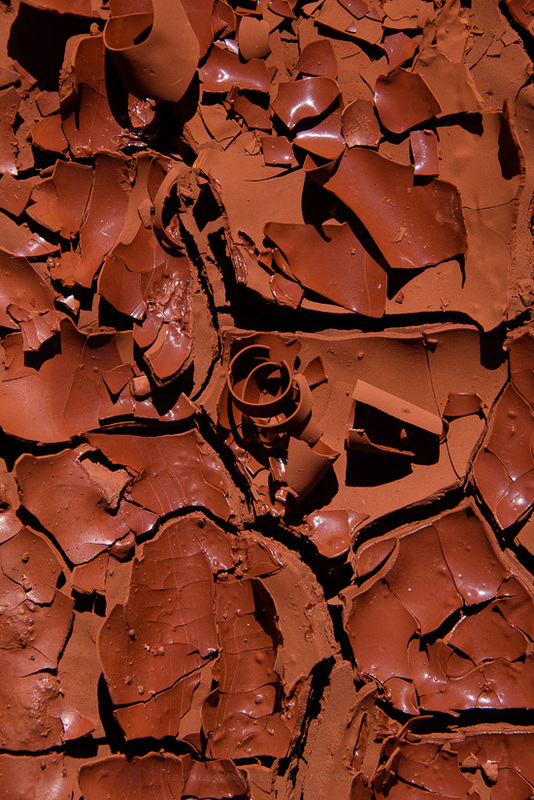 From deep rich red (like the one above) through browns, greys and creams. 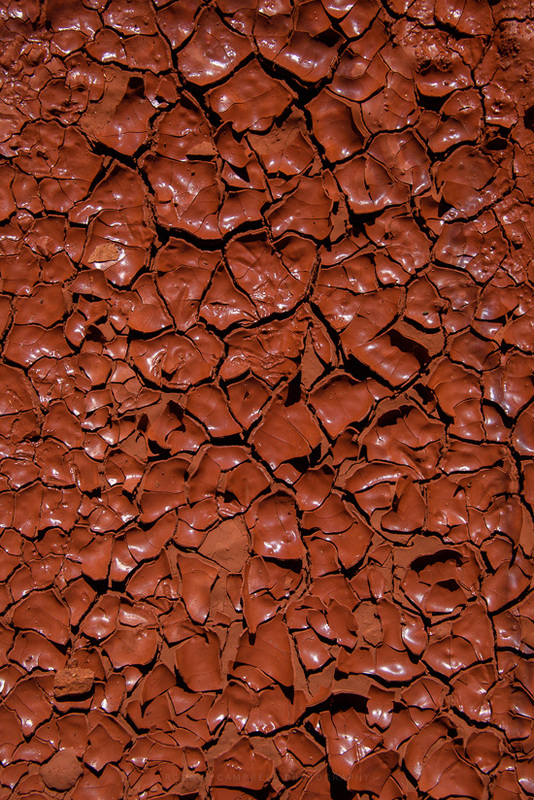 Basically they reflect the colour of the underlying dirt that the ants and termites dig up below to make these amazing structures. 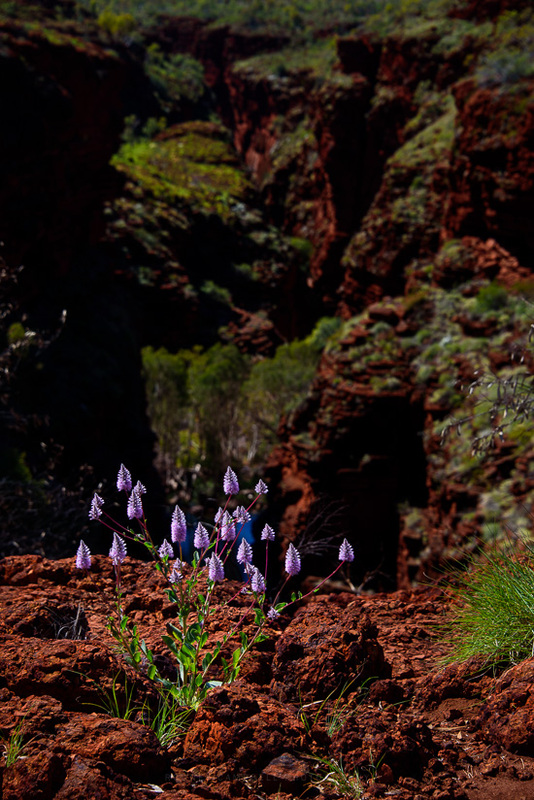 These purple Mulla Mulla also dot the landscape up here in the north and provide a lovely splash of colour against the reds and greens. This is especially the case when they blanket a huge area in a purple swathe. 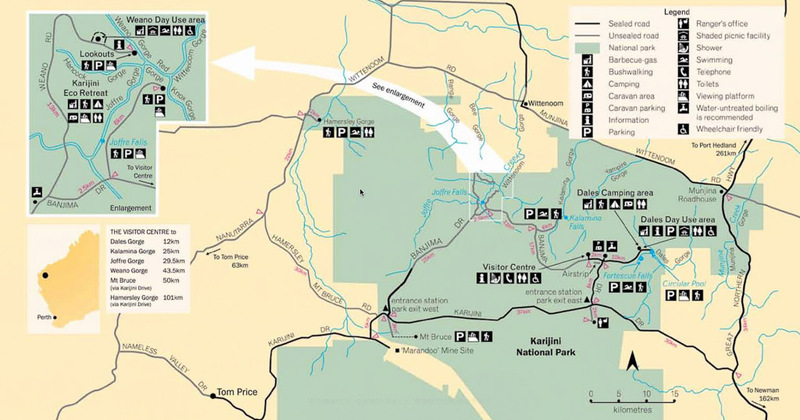 It was Karijini Travelling time… We’d spend two night staying at Dales Campground at the eastern end of Karijini National Park and today we’d be shifting to the Karijini Eco Retreat which is close to the major gorges towards the middle of the park. 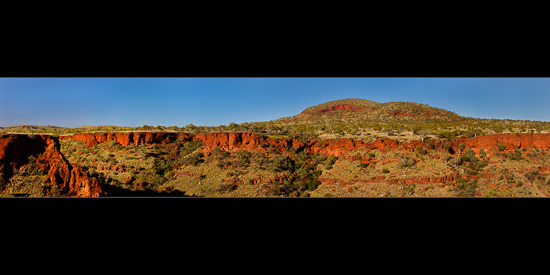 Before we left the area there was just enough time to do a quick redo of the panorama I took at Three Ways Lookout above Dales Gorge. As with yesterday this is a stitched panorama of a number of horizontal frames. Today I took eight (8) frames at 66mm at around 10 minutes past 8 in the morning. By this time the sun had risen high enough to light the gorge walls deep enough so that I could avoid deep shadows on the far walls. The early morning light just punches and accentuates the richness of the epic red cliffs and hills with their cover of green spinnifex and trees against a backdrop of clear blue skies. A magic time to be out. Then it was onwards on our Karijini Travels. Thankfully I’d booked ahead at the ECO Retreat (when we were still in mobile range near Port Hedland a few days back). We’d be staying here for three days (which wouldn’t be anywhere near enough :)). The ECO Retreat is possibly the most expensive unpowered campground we’d been to by far (it was actually more expensive per night than most of the caravan parks with power and water)). The reason I decided to stay here was totally for convenience and time saving. 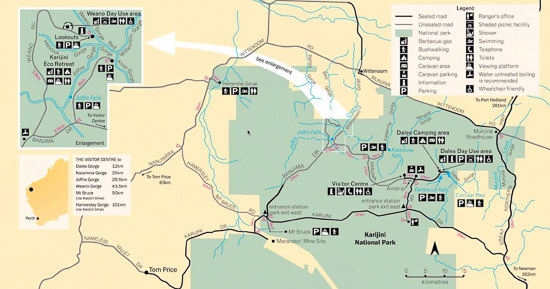 There are three main areas (for photography and just sightseeing in general) in Karijini National Park. The camp fee’s at Dales Campground are very reasonable and the facilities are very good (no showers or power but they do have good toilets). It’s also extremely close to Dales Gorge (you can walk there easily from the campground). However it’s about a 50km+ drive mostly on really terrible dirt roads to get to the gorges in the middle of the park. Or you can take the longer 90km+ route which is almost entirely sealed and is a much better route. The ECO Retreat however is only about 10km to even the furthest gorges in this area. When you are getting up every day before sunrise that extra hour of Karijini travelling each way was soo worth it to me. Plus even though they don’t have a water supply (for the caravans) they do have good facilities with solar powered showers – yes!. Once we had checked in and setup our camp area, my daughter and I went for a bit of a walk around the retreat area to take a look. It’s very hot and dry out here (it’s the wet season after all). 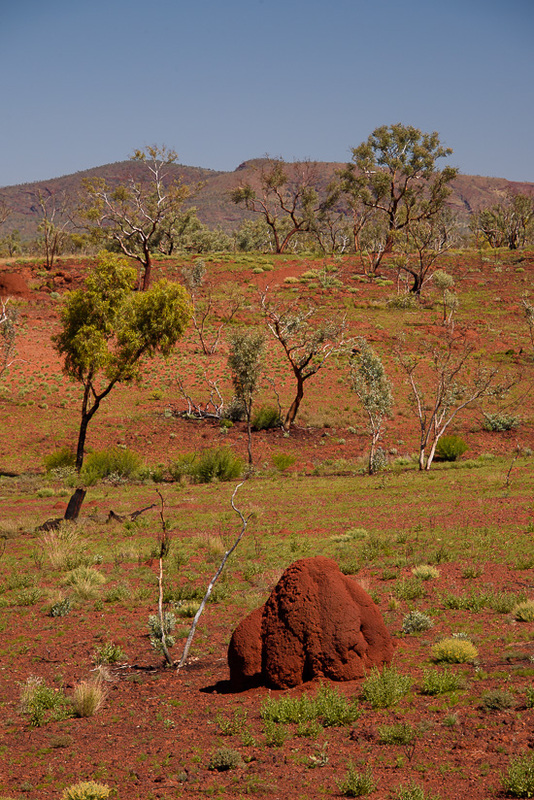 However even with the sun beating down almost mercilessly and the land seemingly dry and arid, still the amazing colours of this outback shine through. Even though it was pretty obvious a bushfire had swept through some time back and burnt everything, new life was springing up everywhere.